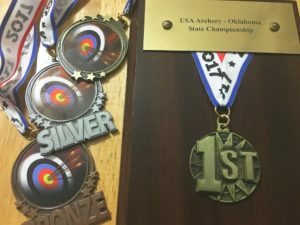 The 2017 USA Archery-Oklahoma State Indoor Championships finished up today at H&H Shooting Sports in Oklahoma City. 93 adult and youth archers competed in several categories in this brand-new annual event. Special thanks to the Oklahoma Storm JOAD team for sponsoring and staffing the event. The full tournament results can be found here at the Oklahoma Storm JOAD site. Pictures from the event can be found on our Facebook Page. Congratulations to all on your outstanding success today!